Returning to Spain from a little over a week in northern France, I decided to pass through the Spanish Basque Country situated around the western corner of the Pyrenees mountains. This would complete the loop around France I wanted to make, having entered via Barcelona and the eastern Pyreness on the other side. Green, beach-blessed San Sebastián was stop number one, just outside the French border on the Atlantic coast. It was love at first sight. But who are the Basques? Before I got interested in Spain or Spanish history, I had never heard of this people group before, but, come to find out, they’ve been interacting with Europe and the world since before the time of the Romans. In short, the defining feature of the Basque people is that they speak, well, Basque—a language with no discernible link to any other European language that has resisted competition from Latin, French, and Spanish for thousands of years. The Basques straddle the western edge of the Pyrenees around the Bay of Biscay and have fiercely guarded their independence throughout history…with mixed success. As of late, however, they have had better luck in gaining autonomy and preserving their mother tongue. Back to San Sebastián. 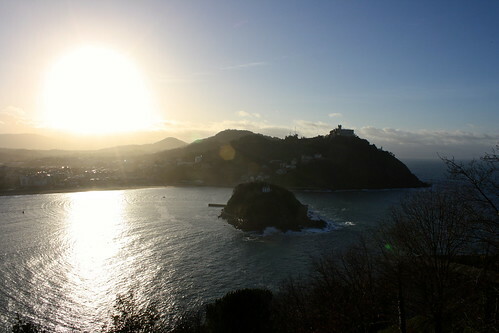 Called Donostia in Basque, this city re-introduced me to Spain after Christmas in France. There couldn’t have been a better welcome mat for the country possible. So, after leaving France’s Loire Valley in late December (Chinon & Azay-le-Rideau), I rode the train south to Aquitaine but ran into a small problem: evidently there was a mouvement social régional (“regional social movement” a.k.a. STRIKE) causing either delays in train services or cancelling them outright. After a few hours’ delay, I managed to make it to Bayonne near the Spanish border, but my hotel was half an hour’s walk from the train station in a dark, sketchy industrial park, it was raining the entire time I was there, and everything was closed for New Years’. I celebrated New Years’ Eve with a Korean girl I ran into at the train station who was just as helpless as I was; she found a room in the hotel I was staying at and then we had dinner at KFC, basically the only place open. The next day, I was going to take the train to visit Saint-Jean-Pied-de-Port—a pretty little village in the French Basque Country and the starting point for the Camino de Santiago pilgrimage—but because of the strike, there was only one train bus leaving for the town late in the day, with no return service. Safe to say, New Years’ in Bayonne sucked. In retrospect, it really shouldn’t have surprised me how much I ended up loving San Sebastián, but I guess when it was juxtaposed with the cruddy experience I had across the border, perhaps I was just ready for anything better. Once I got into town, I ambled on over to the old city and the San Telmo Museum. The premier museum on Basque society in either Spain or France, it moved into a renovated Dominican convent at the foot of Mount Urgull two years ago, so the facilities and presentations were top-notch. 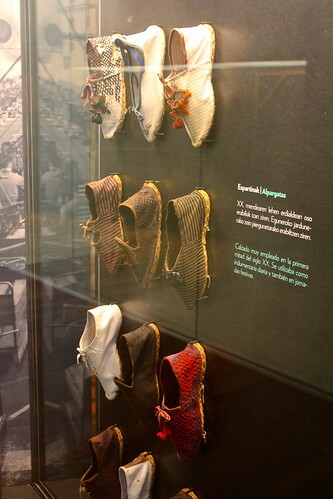 The museum houses a small art gallery and exhibits on the foundations of Basque culture and how it was affected by industrialization, which began in Spain here. For arriving into this corner of Europe knowing little about this people group, I feel like I learned a lot after touring the museum. What I enjoyed the most, however, was the temporary exhibition called “Badu, Bada: Basque Language in a Multilingual World.” Through the creative use of bright colors, corrugated cardboard, sticky notes, and the font Helvetica, they made a simple yet visually pleasing presentation not only about the Basque language but also about multilingual societies in general. I appreciated getting to see how Basque has flourished in the years since the Spanish dictator Franco died, whether via TV, radio, newspapers, or books, and also getting a peek into the sometimes-awkward social dynamics that occur when only some people in a group speak Basque (a minority language)…they automatically have to switch to “neutral” Spanish. Interesting. 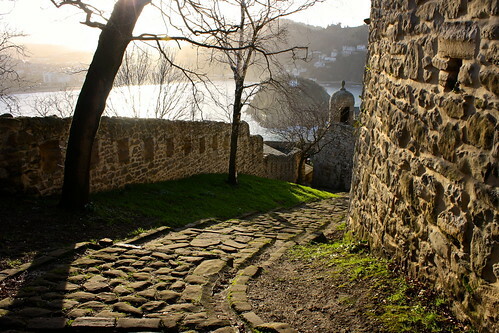 Between the Atlantic Ocean and the old town lies a large hill called Mount Urgull, complete with a castle and defensive fortifications. After I went through the San Telmo museum, I hiked up to the summit where I got to enjoy the most beautiful view of the city, with beaches and two small mountains in my periphery and the whole city sprawling in front of me amidst bumpy green hills. Catching my breath (and emptying my Nalgene bottle), I was so glad to be taking in Spanish air again. 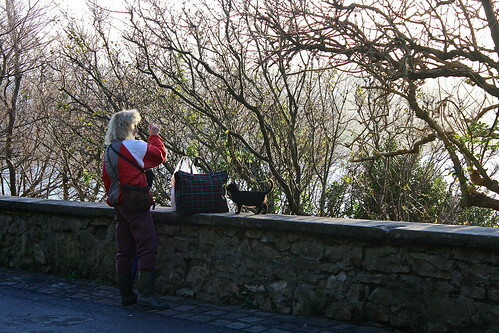 I ran into a crazy cat lady while at Urgull; on the way up, I was trailing behind this Spanish couple who was walking their dog, and there was this woman, scrambling down the side of the mountain in pursuit of a cat. She made clear that she wanted this couple to “control” their super-laid-back dog. The three of us, however, shared some silent giggles. Around the castle, I ran into her again, this time with a *ahem* clowder of cats, at least a dozen strong, trailing her around as she fed them. When I decided to head back down, I was not surprised to see a number of feral cats just chilling on the side of the mountain. 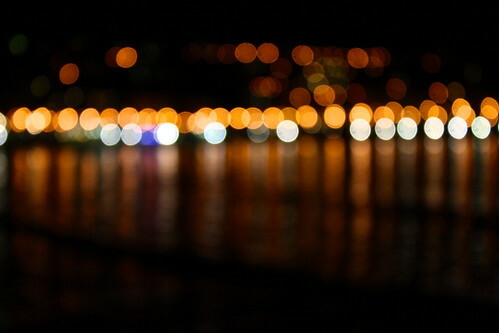 At the foot of the mountain right by harbor, you can visit the city’s aquarium. I wasn’t too wowed by the actual sea creature exhibits (although there were two or three massive tanks that challenged that attitude), but I really enjoyed the part of the aquarium that presented Basque maritime culture. 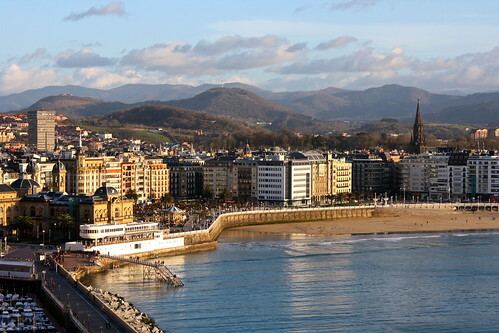 San Sebastián and the Basque Country as a whole have been intricately involved with the sea, be it for fishing or for sailing or for boat construction. The Basques played a huge role in early Spanish exploration of the Americas and the oceans; after all, they perfected the method of preserving cod and ship-building that gave Spaniards an advantage. The aquarium really stood out to me, then, not because of the actual fish in its tanks, but because of how well they integrated the Basque connection to the sea with standard aquarium fare. I always feel obligated to at least duck inside every big Spanish city’s cathedral, and although San Sebastián’s wasn’t much when compared with others the country has to offer (I’m looking at you, Granada! ), it was uniquely Basque. 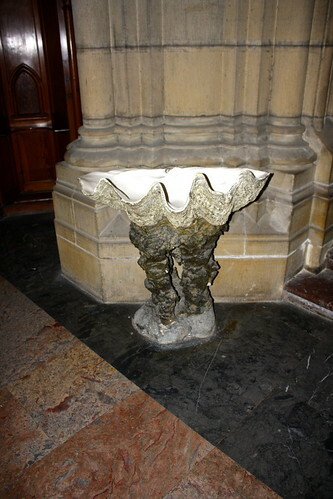 For example, instead of the typical, stately holy water fonts carved from stone, the church had lined half a massive clam shell with plaster and used it to hold the water in dramatic fashion. I think these shells have also been used in place of baptistries, too. The main draw to the city is the pintxos scene (see below), but I loved simply strolling around the old part of town and enjoying being back in Spain again: brushing shoulders with fur-coat-wearing grandmas out for their afternoon stroll (paseo)…speed-walking past shoppers out to catch recently-marked-down bargains…seeing all angles of the municipal nativity scene (belén)…inhaling the cool, humid air of the quiet, coastal sidewalk…and feeling oddly comfortable back in my temporary home. The Basque Country in general, and San Sebastián in particular, is famous across Spain for its exciting, creative cuisine. Nowhere else is this more evident than in the endless places you can eat pintxos (also spelled pinchos) across the region. 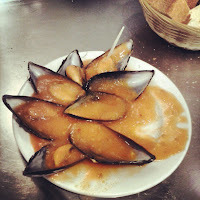 So what are these pintxos? Pronounced “PEEN-choes” ['pin.tʃos], these are little two- or three-bite appetizers of meat, veggies, cheese, or what have you, often skewered together with a toothpick and placed on a small piece of toast. At bars or restaurants (there’s little distinction between the two in Spain, if any), they have dozens of platters or trays of pintxos laid out across the bar either beneath glass or displayed on metal serving trees. Depending on where you are, you either ask the bartender for the pintxo you want or serve yourself with a plate. You can also get a made-to-order pintxo caliente, or “hot pintxo,” which cost the same as the cold ones and are often tastier. Instead of sitting down and having a big meal at a restaurant while in the Basque Country, the thing to do is go find a happenin’ place, pick up a pintxo, and rinse and repeat. Usually three or four can combine to make a meal (but try and go to a different establishment for each one!). Pintxo-hopping will give you a fun and tasty look into the essence of Basque and Spanish cooking. Have you been to the Basque Country before? Have you ever fallen madly in love with a city? Talk about it below!